Negative Self Talk + Absence of Trying = Complacency. This is the equation for ultimate failure. Complacency is a self-righteous (sorry but true) belief that either you’re where you should be or it's a lack of motivation to improve. This sense of self-satisfaction or why bother trying mentality is kryptonite to living your best life! So don't mistake complacency for a playing-it-safe version of your comfort zone. For me, it used to be quite easy to avoid change, taking risks or making real progress. No harm, no foul right? Or I should say, no risk, no fail. This is not unusual. 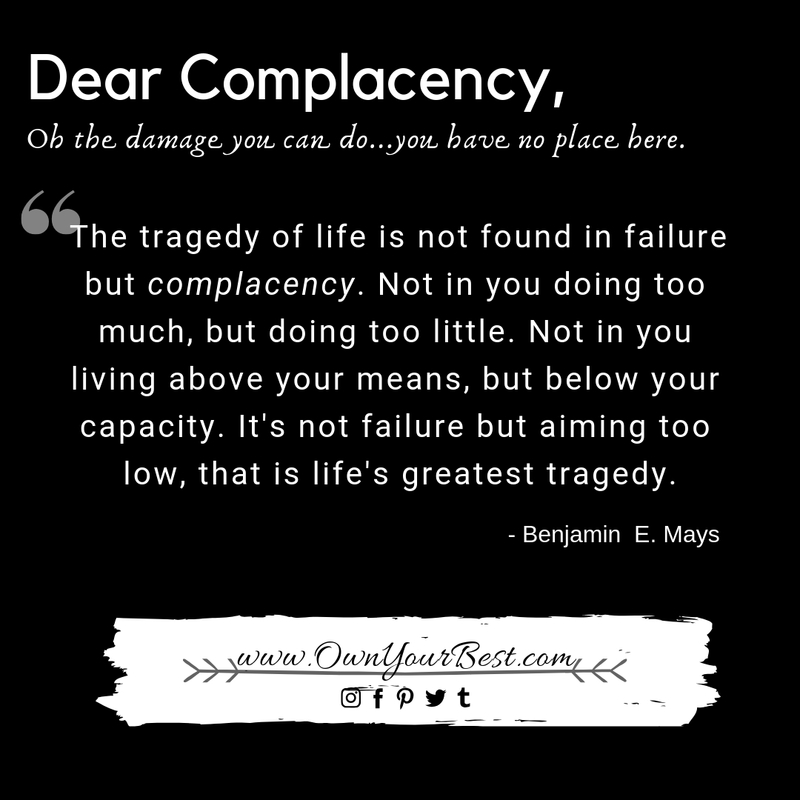 The tendency to fall victim to complacency is alluring and safe … oh it’s also super dangerous. Are you not pursuing a goal because you fear failure? Are you not pursing a goal because you don’t know where to begin…so you don’t begin at all? Do you resist change in general – does certain change give you anxiety? Low self-esteem can be a critical factor in how avidly you pursue a fulfilling and abundant life. Know that your time is valuable and you are worth it. Use resources such as self-help books and podcasts, or follow motivational and empowering influencers (such as Brené Brown, Tony Robbins, Rachel Hollis) to hone in on and tap in to your self-worth. A healthy self esteem is absolutely crucial to combating complacency. Sometimes life is so hectic that it’s hard to put your needs ahead of others. Being last is not an option. Respect your commitments but respect your own well-being more. Know that if you do not fill your own well, you will not have any water left to stay nourished nor nourish others. Translation: Self-care and being the best version of you will benefit everyone else as well. Ask yourself, “Am I doing my best?” Sure you can lie to yourself but you certainly cannot fool yourself. 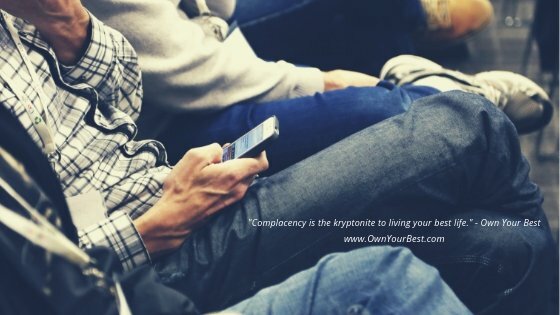 Take conscious ownership of overcoming complacency then you won’t be able to fake it or go through the motions any longer. Only you can own this choice – yes, Own Your Best! Sometimes we don’t know where to start, or what to do first, even what not to do, thus we become paralyzed by complacency. So begin with your immediate surroundings. Look for helpful guides and checklists to not only zero in on your goals but to literally make room for them as well. Declutter your life. If you think you need to stop being complacent there’s also a good chance you’re not truly enjoying life. That’s a powerful message you need to hear. Feeling bad about your life doesn’t mean you have emotional problems or that you’re psychologically damaged in some way. When your life is out of whack for whatever reason, you just need to take action to improve your mindset and situation.